This week I tracked down the omniscient admin GiantBoyDetective as he roamed in Hyrule. We talked about his job as a teacher and a little bit about how he intertwines fun and teaching in his job! We also talked about his gaming habits and how it relates to his life. Header credit goes to Stormborn (aka Bonny John). Hello once again TAY! This is my weekly article series where I interview the diverse authors of TAY, new and old. We all have stories, ambitions, and hobbies to talk about that make TAY a special place. This series is a way for everyone to tell their story and get a chance in the spotlight here on Talk Amongst Yourselves. I'm your host: Dex. Let's start this off like we have the last couple of times! Who is GiantBoyDetective? Well, GBD is basically a large child. Which is why that name works out so well. I'm just a really, really big kid... like actually big. I'm 6'7! It's hard to define what makes me... me, but I guess just my sense of humor, my want to make things better, and my love of gaming. Also I solve crimes in haunted lighthouses! Solving crimes in haunted lighthouses? I didn't read about that! Oh yeah. Most of them are haunted ship wrecks and all that. I just solve the crimes. As you can see, Dean Venture is a fan of my work. Haha! Indeed I can! I've also heard that you're a teacher in real life! I must say, I respect that a lot. How do you like doing it? You know, to be honest, it's both wonderful and, at times, terrible. I love teaching and I love being around kids; they have the same kind of energy I do, but there are a lot of politics and organization that go into teaching that people don't see. It stresses me out. I feel a lot of pressure from my administrators and parents. At the end of the day though, it's just nice to know I can make school fun and silly for kids who have kind of given up on it. Why can't class be fun? Why can't your teacher be part stand up comedian? It's so easy to reach kids if you know how. To me, just managing to show up and teach a bunch of rowdy kids is enough to win an award (I used to be one, I know), but you're taking it even further! You sound like you want to have fun with them while you teach and have the enjoyment flow both ways in the classroom. Any particular examples of how you've tried to bring the fun into your classroom? It's as easy as bringing up pop culture terms that kids assume adults have no clue about. I've taught whole lessons with a fake beard. I've taught whole lessons speaking with a thick Russian accent. I also created a classroom management system called ClassRealm! It turns the classroom into a real time RPG. I haven't been able to use it as much this year due to a few changes the school made with the students schedules though. If I want a kid to remember something I'll jump up on to their desk and maybe sing it. Today we learned about rotating and revolving in space, so we all stood up and spun around the room, because who doesn't want to do that? This classroom sounds awesome and lively, I'd have loved to be in it back when I was their age. So, does this child-at-heart theme contribute to your gaming habits? We just heard about your ClassRealm system (which is quite awesome by the way), so you clearly have some gaming passion in you. What sorts of games do you enjoy? I grew up with Nintendo and that's where my love of gaming really lies, but I'm a huge fan of platformers, both 2D and 3D. They're my bread and butter. I don't need a plot and I don't need deep character development; I just want to run and jump. I'm a huge fan of collectathon 3D platformers as well, which is probably why the N64 is my favorite console. Also a huge DK fan as I have an actual 1981 DK cabinet in the loft. Yeah, right upfront I'll tell you that everything you're telling me is amazing: cool teacher, cool wedding+wife, cool DK cabinet! I'm jealous. The most I've got is my family's Area 51 game cabinet! All that said, which franchise is your favorite (or can you decide)? In addition, what's your favorite game? Banjo Kazooie is my favorite game. Hands down. I'm currently playing through the Japanese version. The Smash Bros series is a close second. I tried to get into the professional Smash Bros scene back in 09-10, but I wasn't too great and I didn't have lots of time to travel. I do plan on trying to get good at Smash 4 right off the bat and get around to some tournaments. I'm actually better at putting on Smash tournaments than competing in them, which is fine since it's a very fun environment. Banjo is just such a solid title with goofy characters, great music and lots and lots to collect. I still discover things when I play through it, which I do pretty much every year at some point. Impressive! It must be very special if you've kept the system and game going this long! I know the feeling of course with my freakish love of Ace Combat. On a different note, you're clearly a big guy around here on TAY. How did that happen? I paid Stephen Totilo a cool million in cash. But, in reality, I've just been around forever and love contributing in anyway possible. I know there seems to be a lot of hate for Kotaku, but I've always found that some of the best folks on the internet hang out around these parts. You have to occasionally wade through some trolls and crap, but in the end there are just so many wonderful regulars that I could never leave. Anyway, TAY is a nice lively place full of some really talented and fun people! It's a big reason that I've kept coming back to contribute. Are there any memories you have from TAY that have really defined it for you? Oh geez. Well. There's so many. Secret Santa was fantastic. Everyone was so excited and I feel like it all worked out really well... though I'm not sure if Bonny has gotten his present yet... haha. Sorry Bonny! Something else that stands out is just the relationships I've built up over the last year. I've gained a lot of friends. Very generous friends. Just seeing the TAY grow from what it started out as last year is extraordinary. Reviews. Art. Opinion pieces. News. It's only going to get better. I've felt like it's even gotten better in the short time since I joined! That was only a few months ago too. There's a lot of quality material out on TAY with some great columns and great one-off articles in bulk. It's been great to see it all come together. As a closing question, where would you love to see yourself in the future? Still teaching? Would you like to be doing something slightly different? You know that's a really hard call. I could see myself stepping away from teaching for a while to pursue some other interests, but I'm not sure. I'd love to write about games full time and fly around to conventions and get games for free (I may already get a few... don't tell). I've also thought about making educational games full time, or possibly working on normal video games if the chance arose. I'd also like to write a novel. I have many many aspirations and ideas. Hopefully some of them come to fruition. I'd also like to be dad at some point down the road. I think everyone on Talk Amongst Yourselves and on Kotaku will join me in wishing you luck on all of that! You're an incredible member of the TAY and Kotaku community and I've enjoyed speaking with you immensely. You sound like a great teacher and (assuming the last bit...) you'll be a great dad. 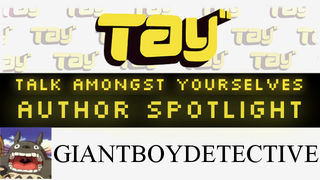 Thanks for stopping by the TAY Spotlight GiantBoyDetective! What's that? Seems there's a phantom lurking around a lighthouse up in Vermont. I must go. Good luck GBD, we're all counting on you. You can catch up with Ben Bertoli on his ConTAYct list on TAY or on Twitter @SuperBentendo! Welcome to my wonderful world. Interested in getting to know TAY better? Check out our main TAY page and start commenting! Why don't you go over and read up the TAY Tutorial so you can get writing yourself? Hey, maybe I'll interview you next, wouldn't that be cool? This interview was facilitated by Google's Hangouts. Have someone that you want interviewed? Want to contribute by doing your own interview and taking over for a week? Comment or drop me a note at Dexomega@gmail.com.